I was likely the first person to diss/mock Fort Garry about producing poor quality beer, as I once stated that any brewery that produces beer to be served in plastic bottles isn't taking themselves seriously.. as you're only good as your worst product. However, under the brewing supervision of Matt, Fort Garry has changed my ways.. in fact, every time I visit Winnipeg, I always make a stop into Winnipeg to have a chat with Matt and discuss beer. Ever since Fort Garry started the Brewmasters Series with Munich Eisbock one year ago, I was quickly surprised how good the seasonals were, good enough for me to 1) Actually buy the product, 2) Hoard said product and 3) Actually rave about said product! Kudos to Fort Garry! 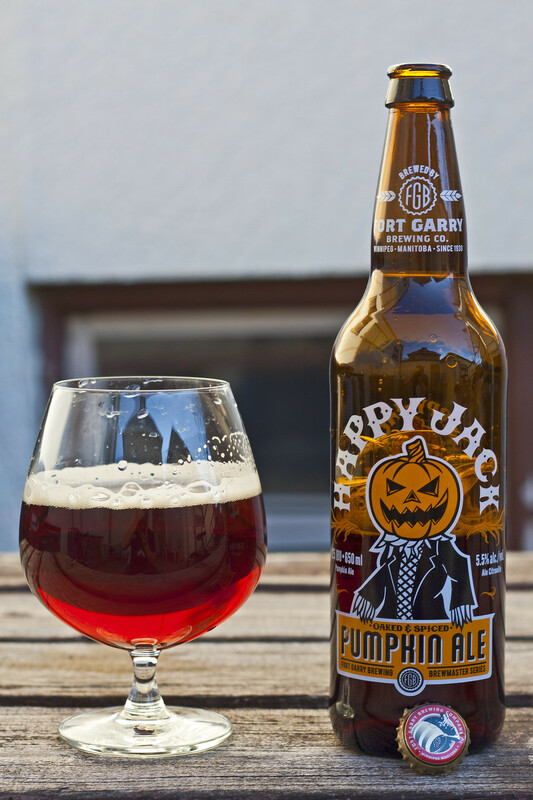 Continuing the Week of Pumpkin Beers, it's time to review Fort Garry's new release in the Brewmaster's Series, Happy Jack Pumpkin Ale. As you likely know already, growing up as a picky eater, I absolutely disliked pumpkins, so much so that I refused to ever try pumpkin beers.. but hey.. this is the second pumpkin beer (out of three) that I'm reviewing in the past day or so! Appearance: The appearance surprised me right off the bat. I expected a hazy orangey beer, somewhat like yesterday's Great Lakes Brewery's Pumpkin Ale review, but nope - it's an incredibly cherry red beer, quite clear, and a bit reminiscent of unlike any beer I can think of at the moment. A bit of a light beige head, that quickly diminishes and ends up being a light bubbly film that clings to the side of the glass. Aroma: As soon as I opened this Happy Jack, I could get a powerful aroma of cinnamon, nutmeg and brown sugar, and a hint of oak even with it being a windy day. It's quite similar to the Great Lakes' Pumpkin Ale, but even stronger smelling. Taste: The first flavour that hits my palate is oak, which I like as I was expecting the oak to be muted for the most part. Followed by the oak is a sweet combination of brown sugar, cinnamon and nutmeg, very sweet.. even sweeter than Rickard's Cardigan. I like this because it has a bit of a dessert appeal to my palate, yet isn't overpowering in sweetness so this could be a sharing beer, a Sunday afternoon beer or "heck, I need an afterwork" beer. There's not much of a pumpkin taste to it, but it does make an appearance the very moment the beer enters my mouth, then quickly diminishes - which I'm fine with, as I still hate pumpkins! Overall Thoughts: I'm quite pleased with this beer as the appearance is a very bright cherry red, which you don't expect, it has a nice powerful autumn themed aroma with cinnamon, nut meg and brown sugar, the taste is a nice sweet and welcoming combination of flavours, almost as if you're getting some fresh baked gingerbread cookies. It costs around $6.80 for a a 650ml bottle, so a bit pricier than even Great Lakes' Pumpkin Ale, but this beer will easily disappear off the shelves, so pick one up while you can. It also has 5.5% ABV and 25 IBU. I also love the look of the painted label, but seeing how their previous release, Kona stout was delayed several weeks due to a delay on the bottle labeling, it would be cheaper for Fort Garry/Russell to just have paper labels instead, and the bottles can be reused again that way. From the label: A wonderfully balanced Pumpkin ale, with a hint of oak and spices, make this refreshing beer ideal to share with friends. 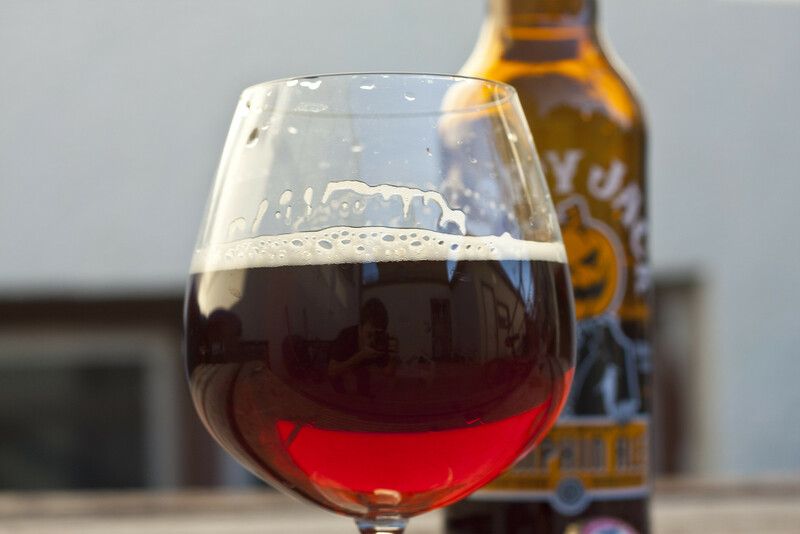 Single batch brewed with real pumpkin, whole spices and aged with oak.